After more than 30 years in the antique business, George and Judi Lee wanted to create an interesting, relaxing experience where everyone is welcome to browse and dream. Stroll through Paris on Ponce's three buildings where you will find everything from 18th century antiques to new designer furniture at less than wholesale prices. 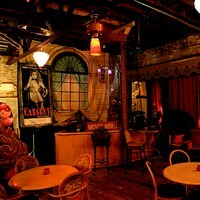 Paris on Ponce also offers event rental space, Le Maison Rouge, and 50,000 square feet of prop rentals. Come by and experience Paris without leaving Atlanta! Parking: Parking is available in the rear of the building through the alley to the right of the entrance.